Peace agreements do not make peace. Neither does the arrival of international peacekeepers. Transforming the conditions of instability and post-conflict reconstruction into lasting peace requires stable relations within and between the state and society. While peace agreements and international intervention are often necessary stimuli, most essential is the partnership of people and government. Currently, Future Generations is developing a follow-up to its prior research which takes a courageous leap from only studying processes of peace in different contexts to implementing community-based interventions and comparing the impact on relationships in communities with other more traditional approaches. Partnerships are being developed in a series of countries to provide local leadership and expertise for this work, and we continue to partner with the United States Institute of Peace (USIP) for technical assistance and invaluable connections to emerging evidence bases and other expertise in the field. Future Generations recently concluded an exciting project in the realm of peacebuilding research, partnering with United States Institute of Peace to develop a bottom-up process of identifying Key Indicators of peace. The Everyday Peace Indicator Project sought to find how alternative, local indicators of peace can be meaningfully integrated into policy processes. Typically, methods used to study peace yield complex, scholarly results that are not directly relevant, useful, or sometimes even intended for communities to understand. Through development of ‘indicators of peace,’ this project, through local participation and local ownership, produced sensitive local understanding of interventions in peacebuilding and conflict transformation. The assertion is that communities are best placed to measure and interpret their own peace. This study advances that real solutions to violence are inside communities and through research, answered what local communities can do to address violence and build peace. The objective was to equip communities with evidence at the neighborhood level that can inform community behaviors that may curb the violence. Once stability is created, then social and economic conditions can advance. 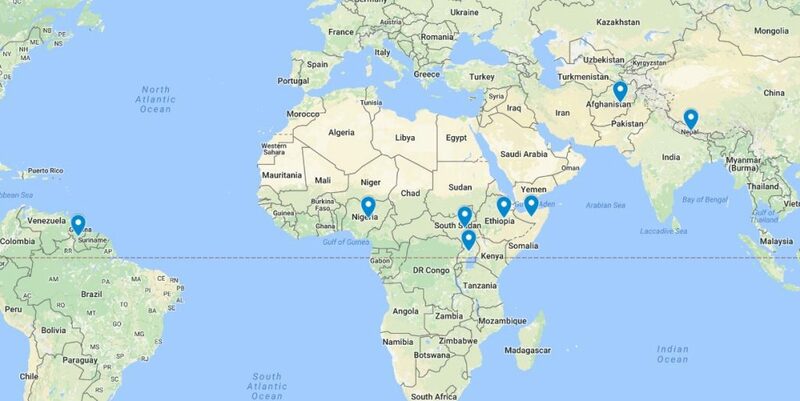 Future Generations alumni and current MA students conducted the research across eight countries(Afghanistan, Ethiopia, Guyana, Uganda, Nepal, Nigeria, Somaliland, South Sudan), each with very different challenges of violence. This built on a four-country experiment started by the United States Institute of Peace (USIP). Map showing the eight countries where research into Everyday Peace Indicators was conducted. Everyday Peace Indicators (EPI) aspire to reflect viable metrics by which local levels of violence can be assessed. They are measurable and can be operationalized by community members. EPIs must be specific to each community. Perhaps in some distant day, there can be universal indicators, but the evidence so far suggests each community must find its own. EPIs will be most useful the more they are used—across time to give trends and across the population to expand the population that is using them. Researchers in the eight countries worked with communities to identify specific EPIs and develop those into projects and programs. In all cases, the next steps were site-specific and plans were put into place for monitoring and evaluation. Future Generations University is working to further develop a multi-sectoral approach this study. The challenge is: how can citizens and communities help create the conditions of peace. What are the most effective approaches to stimulate broad-based, community-driven peacebuilding? To answer this question, Future Generations, with support from the Carnegie Corporation of New York, conducted a multi-year global study of the role of engaged citizens and communities in building peace. The project joined the collective experience of scholars and practitioners engaged in bottom-up peacebuilding with Future Generations’ own insights and experience in promoting partnerships between communities, governments, and external actors. This study resulted in the Peace Building Series of Occasional Papers below. New insights and understandings from this project continue to be disseminated to the academic, policy, and practitioner communities. People’s Participation in Conflict Transformation: A Case Study of Jana Andolan II in Nepal by Bandita Sijapati, February 2009. Communities and citizen groups at multiple levels (local, regional and national) mobilized across class, caste, ethnic, and religious divides to effectively topple the royal regime and help bring an end to the 10-year Maoist conflict. Statebuilding & Community without Reconciliation: A Case Study of Afghanistan’s National Solidarity Program by Jason Calder and Aziz Hakimi, March 2009. Recognizing Afghan capacities at the village level, a nationwide community-driven development program employing government, community, and NGO partnership has been one of the only large-scale successes in Afghanistan’s reconstruction. Seizing the Moment: A Case Study in Conflict and Peacemaking in Somoliland by Rakiya Omaar, January 2010. Although ineffective government and bloody factional fighting marked the first two years of Somaliland’s independence from Somalia, the people of Somaliland took responsibility for their own peace and began building a new democracy. Toward Ethnic Conflict Transformation: A Case Study of Citizen Peacebuilding Initiatives on the 2006 Guyana Elections by Roxanne Myers and Jason Calder, November 2011. In advance of the 2006 elections, government, international partners, and civil society mounted extensive peacebuilding efforts that averted violence, resulting in the most peaceful elections of the last 15 years. Building the Peace Architecture from the Bottom-Up: The Experience of Local Peace Committees in Burundi by Rene Claude Niyonkuru, November 2012. In areas scarred by the violent power struggle between the Hutu and Tutsi ethnic groups, local non-government organizations spearheaded two peace initiatives owned by ordinary citizens that led to significant changes in peoples attitude and behavior. Summary of Findings: Engaging Citizens and Communities in Peace Building Project by Jason Calder, December 2012. The results of this series of case studies points to the importance of local rootedness in sustainable peacebuilding efforts. Beyond seeking locally owned approaches, the search should be for locally born ones.